While Mother Nature decides if fall is hitting Michigan early this year, I’m trying to get as much fun outdoor activity in as possible. 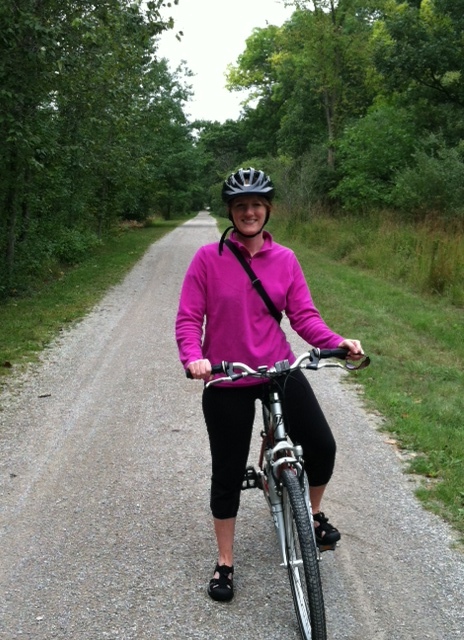 My latest activity took me to Paint Creek Trail, an 8.9-mile trail that starts in Rochester and ends in Lake Orion. Paint Creek Trail was the first rail-to-trail in Michigan. The rail line began as part of the Detroit and Bay City Railroad Company, which later became the Michigan Central Railroad. Then the rail line was run as Penn Central Railroad until that company abandoned it in the 1970s. Finally, the state and communities purchased the property in the 1980s with the intent to reuse it for resident activity. The trail surface is mostly crushed limestone. It was in excellent condition when we went, despite a few heavy rains earlier in the week. The trail is open to pedestrians, bikers and even horses (horses are allowed north of Rochester Hills). It was fairly quiet as we biked so we enjoyed hearing the river and trees rustling. The trail connects to the Dinosaur Hill trail system in Rochester that I explored in the past with my niece (although I don’t think bikes are allowed on those trails). There are only a few restrooms along the trail – at the Rochester Municipal Park, inside the Paint Creek Cider Mill Building, and in Orion Township. There are some restaurants at certain points near the trail so you can purchase food/drink (or use their restroom). My friend and I splurged with a stop at the Paint Creek Cider Mill to split a cup of cider and warm donut. I couldn’t remember the last time I had a donut and it tasted good! There is also a bike station outside of the cider mill building, with a bike pump and tools you might need. That was nice to see. The cider mill is the halfway point of the trail, located at Orion/Gallagher Roads. While there are some road crossings, you’re far enough north that traffic is minimal at most of the crossings. Although don’t be fooled by your location out of the city atmosphere – some cars drive really fast down the dirt roads so you need to still pay attention when crossing the intersections. Overall it’s a really nice trail and I would definitely go back. I didn’t have my phone available to check for geocaches but I’m certain there are some along the trail so we’ll look for those when we return.